"I live, I die. I LIVE AGAIN!" Time to check your bank account balance. Mondo has announced a timed sale next week, meaning it will be very easy to get your hands on any of these prints if you really want one. 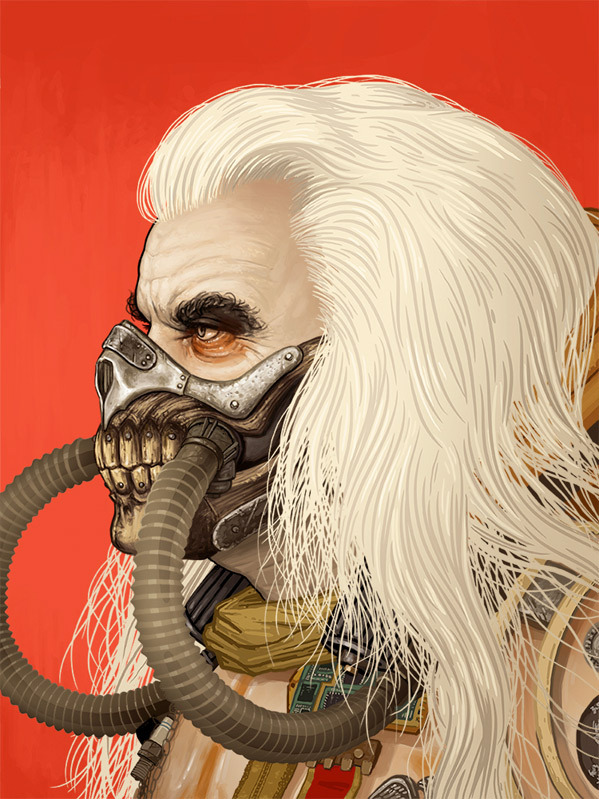 The new prints are for Mad Max: Fury Road, licensed officially with Warner Bros, made by two different prominent veteran Mondo artists - Ken Taylor and Mike Mitchell. 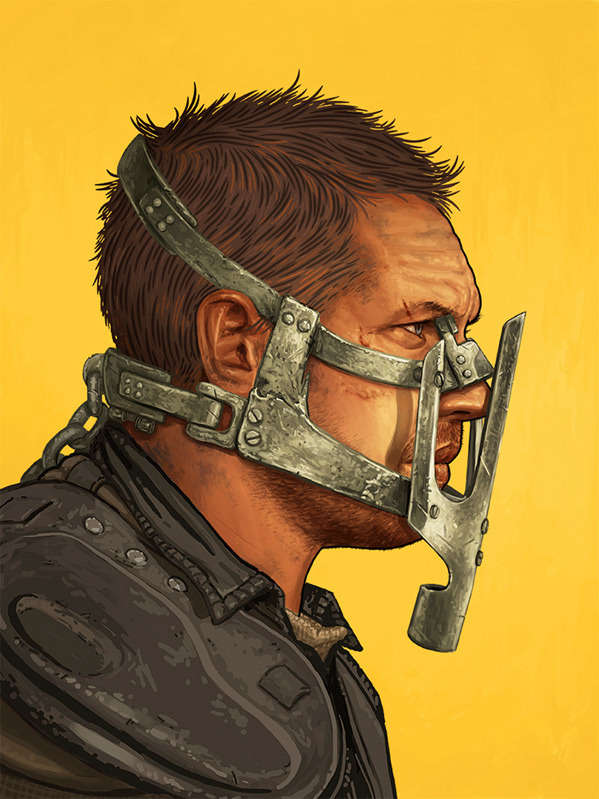 Mitchell's set features a face-to-face dyptich showing the new Max Rockatansky, played by Tom Hardy, with this face mask on - looking across at the brutal Immortan Joe, played by Hugh Keays-Byrne. The other print shows the war party chasing down Max on the front of the car in the beginning, with a beautiful blue sky in the background. I might end up actually ordering one of these myself, we'll see. Take a look at both prints below - on sale on August 11th. 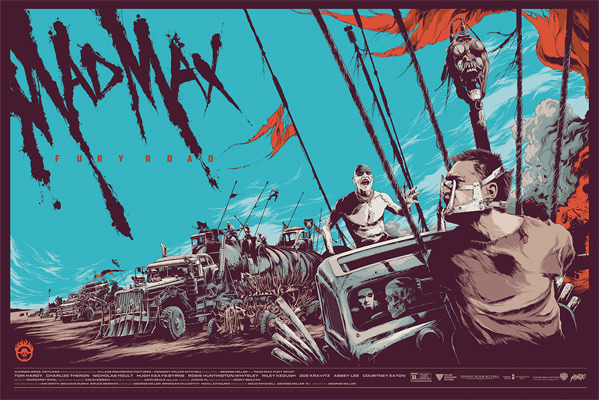 First - here's the Ken Taylor Mad Max: Fury Road 36"x24" print with blue hues. These sell for $55 each. Next - here's the Mike Mitchell Mad Max: Fury Road set. Each one is 12"x16", for $55. Or as a set for $100. For more info and to view each print fullsize click above. These were unveiled by Collider, where they have info on the sizes and more details. The art will be available for purchase for 72 hours only from Tuesday, August 11th until August 13th on MondoTees.com. Four random people who buy Taylor's art will also receive original artwork from Ken featuring one of the characters. Finally, a chance to get art from Mondo. Mad Max: Fury Road is a reboot of the adventure franchise that began with Mad Max in 1979, starring Mel Gibson. George Miller, the director of the original film and its sequel, is back behind the camera, working from a script he co-wrote with first-time writer Nick Lathouris. Within this world of fire and blood exist two rebels on the run who just might be able to restore order. There’s Max (Tom Hardy) a man of action and a man of few words, who seeks peace of mind following the loss of his wife and child in the aftermath of the chaos. Meanwhile, Furiosa (Charlize Theron) is a woman of action who believes her path to survival may be achieved if she can make it across the desert back to her childhood homeland. Nicholas Hoult, Zoe Kravitz, Riley Keough and more star in the film. Warner Bros first released Fury Road on May 15th this summer. I've never, ever seen a Mondo poster hanging on a wall. I'm okay with this. Basic, but cool. I really hope they allow this to become a kickass (re)franchise! Cool but no Furiosa poster? Mad max is by far the best movie of this year. Yesterday I did see Mission Impossible and it was a little bit disappointing like Jurrasic world .... Cool posters !